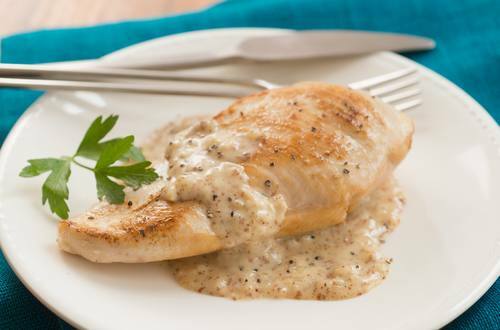 1 Heat 1 tablespoon Hellmann's® or Best Foods® Light Mayonnaise in large nonstick skillet over medium-high heat. Season chicken with pepper. Cook chicken, turning once, until browned, about 8 minutes. Remove chicken and set aside. 2 Cook onion in same skillet over medium heat just until softened, about 2 minutes. Stir in remaining 3 tablespoons Mayonnaise, mustard, milk and honey. 3 Return chicken to skillet and cook covered over medium-low heat until chicken is thoroughly cooked and sauce is hot and bubbly, about 4 minutes.